ICT is the foundation of Creative Economy. It makes the existing products and services advanced and creates new products and services. We are living in the age where Big Data, Mobile and Wearable are controling our daily lives and the development of related technology and its application are constantly made. Some of them have surprised the world and made an astronomical amounts of money. Chosen for 2013 Creative and Industrial Convergence Human Resource Education Program supported from Ministry of Trade, Industry and Energy, Sungkyunkwan University has run Graduate School of HumanICT Convergence(H-lab) on a 5 year subsidy of KRW 3.5 billion provided by the government. The university's H-lab Prof. Cho said "With the support from the Ministry of Trade, Industry and Energy, and under the slogan of 4H (Hands, Head, Health, Heart), we are carrying out effective R&D and training in pursuit of happiness of human beings on earth. It is our goal to make our H-lab students as 'emotional convergence humaneer (human+engineer)' who will make a breakthrough in the smart healthcare field." Futurologist Richard Watson once said "Emotion and design get more important as the development of cutting edge technology make an advance." Prof. Cho said "The emotional ICT industry is estimated to create a market worth KRW 26 trillion (one quadrillion on global market) by 2020. In order to do that, the integration of IT, BT, CT, DT and MT is a must. To take a greater part in the field, H-lab currently is providing various combined programmes covering electronics, computer science, chemical engineering, new materials engineering, mechanical engineering, design, psychology, cognitive science, medical engineering, administration and techno-management in the hope of promoting smart leaders and products made with emotional technology." H-lab has made numerous achievements. The lab invented Smart Wig for Cancer Patient and won the director's prize of Samsung Electronics DMC Research Center at a wearable device fair held in KAIST. Prof. Cho has applied for a patent and is preparing for commercialization of the wig. The team also won the best prize at 2nd Global Hackathon Wearable Challenge with an app that broke the boundaries of smart watches, and the bronze prize at 27th Global Software Contest with a dietary improvement device. Other inventions include 'Posture correction platform (physical avatar + digital avatar)', 'wearable health care smart bend' and 'IoT-based sense transmission wearable device'. In November last year, Prof. Cho successfully held 1st International Human ICT Fusion Symposium and initiated exchange in the field of smart health care information and technology. He said "I will keep holding the international event yearly basis to promote global cooperation in the field." 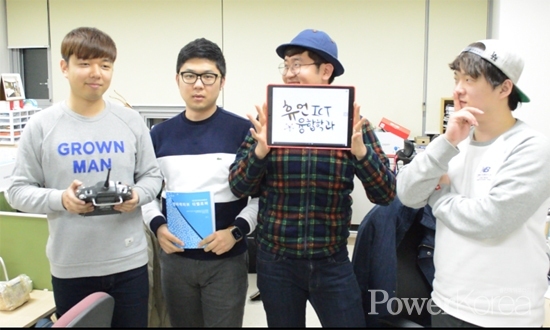 Power Korea sends a message of support to Prof. Cho and H-lab.